Pain is common in older people and its assessment is an important part of the nurse’s role. Asking people about their pain is considered the most accurate and reliable assessment because of the subjective nature of pain. A number of simple and easy-to-administer self-rating scales are available to measure pain intensity. To rate their pain, however, people need to understand the request, as well as recall and interpret the painful signal. Observing specific behaviours associated with pain is advocated when communication and cognitive function are impaired, for example, in people with advanced dementia. A number of pain assessment tools have been developed that involve observation of some or all of the behaviours. 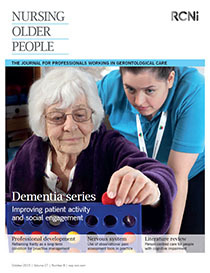 The aim of this article is to highlight the importance of pain assessment, discuss the various pain assessment scales and tools available and identify some of the factors that can make comprehensive assessment of pain in older people and those with cognitive impairment complex.